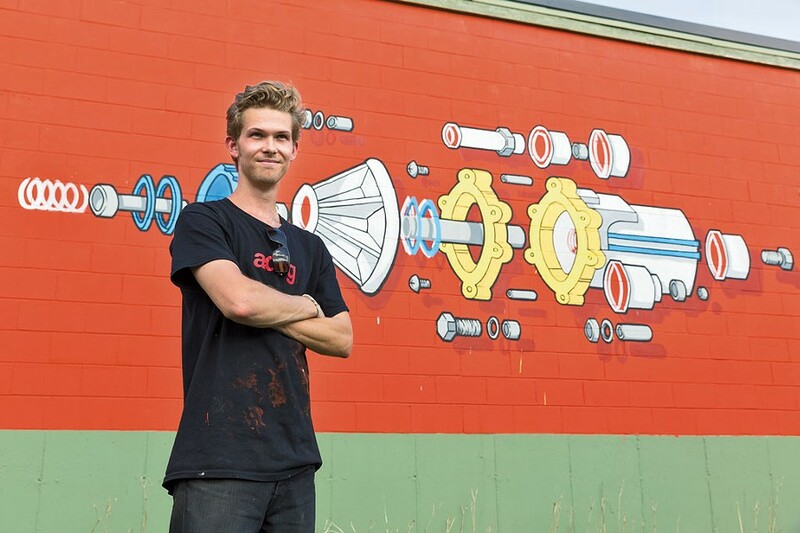 As the South End Art Hop gears up for its 23rd annual extravaganza from September 11 to 13, artists Max Hodgson and Dana Heffern got a head start on the weekend by creating two new murals on Pine Street. Heffern had help from a posse of Burlington College students and professors. Burlington native Hodgson is a 23-year-old visual artist and rapper who currently resides in Brooklyn. (He performs using the stage name Vader the Villin.) His first South End mural, painted in early July on an exterior wall of ReSOURCE, is a colorful, cartoony depiction of a fox and a rabbit reading Seven Days. For his recent contribution to the Soda Plant, owned by Steve Conant of Conant Metal & Light, Hodgson created a more graphic exploded diagram of a pseudo-realistic engine part. "I came across some old assembly instructions for some metal engine part, and the look of it really intrigued me," the artist says. "I've always been interested in things being taken apart and almost floating. Steve seemed to think it went well with what his shop deals in, so I was stoked he was down with it." The fictional machine part depicted on the long red wall speaks to the imaginative and artsy ethos of the entire sprawling complex — which, in addition to ReSOURCE, houses jewelry maker Rackk & Ruin, the S.P.A.C.E. and Backspace galleries, the new storefront for Vintage Inspired Lifestyle Marketplace, and other enterprises. "The Soda Plant is a creative place, and I want that to be evident to people on the street," Conant says in an email. "Max's art reflects the creative stuff that goes on in [there]." Just across Pine Street, Heffern and her Burlington College team have given the south-facing wall of Tapna Yoga a face-lift. The building is co-owned by Nigel Mucklow of New England Floor Covering. Until recently, the wall presented a mural by Amanda Hallock of a headless woman holding a bowl of goldfish. It was the subject of some confusion. To many, the painting appeared incomplete, but, as Hallock told Seven Days reporter Liz Cantrell last December, "If some people think it's unfinished, that's art, I guess." The East Montpelier artist suggested that the confusion created by the headless woman was intentional, forming an integral part of the mural's message. While some may have thought it was too soon to paint over a mural as relatively new as Hallock's, Mucklow has a laid-back attitude about the whole affair. He notes that John Bates, owner of nearby Vermont Art Supply, had approached him about installing a new mural. "And I said, 'Well, Art Hop is coming up again, so let's do it,'" Mucklow says. Hallock was not notified that her mural would disappear. If someone approaches Mucklow next year and asks to paint the wall anew, he would be fine with that, he suggests, saying, "I'm not really here to judge it or promote it. It's just a canvas." For the new mural, Bates reached out to Heffern, chair of art and design at Burlington College, because of her extensive experience painting scenery for Broadway shows. (She's led painting crews for Tony-nominated productions including Billy Elliot, The Lion King and The Phantom of the Opera.) As a group of students had recently assisted Heffern in painting a mural for Oh my DOG, a daycare and boarding facility in South Burlington, she asked if they wanted to help with the Pine Street project. "Even though they didn't receive college credit for their participation," Heffern says in an email, "they just wanted to keep working, to have the opportunity to paint another large-scale piece of art." From multiple concepts submitted by the students, Bates and Heffern chose the design by Kacie Cotter-Sacala that now adorns Tapna's wall: a black-and-white butterfly on a geometric red-and-ochre background. With paint donated by Bates and neighboring Curtis Lumber, Heffern and crew — also including Tyler Santor, Tim Morris, Abbi Meyers-Orr, Athena Pepe and Courtney Wensley — completed the mural in two days. They got an extra assist from former BC adjunct professor Alex Costantino, a ceramicist; and current one Chris Alley, an architect. Pine Street's two new murals are part of a veritable explosion of public art around Burlington. Farther down Pine Street, artist Mary Lacy is sprucing up the twin silos outside Dealer.com with her signature geometric shapes — on the heels of completing her outsize hummingbird on a St. Paul Street building downtown. New York artist Mitchell Schorr recently completed one installation of his hot-wheeling "Da Race" series outside Pearl Street Beverage and another on the back side of the downtown Mobile station. The ubiquitous Clark Derbes led a group of kids from the King Street Center in adorning the lake-facing wall of the Moran Plant, and other kids — at the Boys & Girls Club of Burlington — have given their quarters a joyful overhaul in the Old North End. As Henry David Thoreau wrote, "This world is but a canvas to our imagination." Not that we should grant blanket approval to all public artwork. As some say, make it good or leave it blank. The original print version of this article was headlined "Just in Time for Art Hop, New Murals Make Pine Street Pop"